Summary: Is it really “magic” that occurs in Writing Project-related professional development? The authors of this report argue that Writing Projects have visible cultural features that lead to the building of successful professional learning communities. Ask teachers to read and discuss this report after they have worked together over time. Their conversation will support them in demystifying the NWP “magic” and unpacking the cultural features that make for successful professional learning communities as a basis for planning their own facilitation of professional learning experiences. 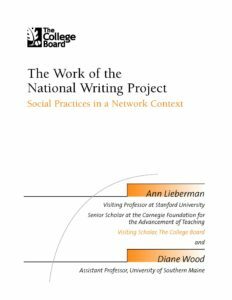 Observing the institutes, we saw firsthand that “the work” is actually a pervasive and powerful set of social practices leading to the creation of strong learning communities (Lieberman and Wood, forthcoming). Three core and recurring activities initiate institute fellows into these practices: teaching demonstrations, “the author’s chair” (The term “the author’s chair” was used in the two sites we studied. Teachers actually sit in a chair in front of the audience to share their writing and get feedback from the group.) and writing groups. Rooted in the WP’s dual commitment to writing-to-learn and teachers-teaching other-teachers, these activities release professional knowledge and establish professional relationships. Each involves teachers teaching other teachers, and each requires public performance with audience feedback. In all three activities, participants alternate between giving presentations and listening to others present. In short, all three stress learning as a social phenomenon (Wenger, 1998).